* To avoid confusion and frustration, we want to ensure the limitations of our different hosting packages are clearly defined. This is expanding on our existing "how limited is unlimited" article which can be found here: https://support.arvixe.com/index.php?/Knowledgebase/Article/View/129/4/how-limited-is-unlimited . If your account is on a CentOS5/1h/Hive server, please see the article at https://support.arvixe.com/index.php?/Knowledgebase/Article/View/192/4/resource-usage-explained . Very high amounts of resource usage may require immediate action to be taken on your account to provide immediate relief (such as disabling the script, etc). If this happens, you will be contacted by one of our system administrators via email. We do not currently have tools to make monitoring of your Windows hosting account resource usage possible. Our next generation linux hosting platform is built on CentOS 6 with CloudLinux, which allows us to better define and manage real time access quotas to shared resources so as to avoid the necessity for manual intervention. This article will outline and detail those limits. 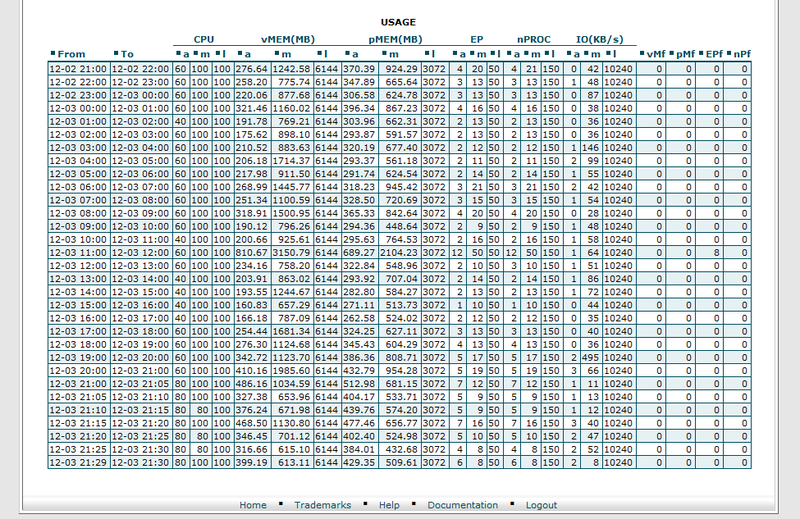 CPU: Each server has between 16 and 40 CPU cores, with each core represented in the above chart as 100%. Even though the kernel may distribute usage across multiple physical CPUs, usage is calculated as a percentage of the total CPU seconds per core per second. Memory: The amount of physical RAM that can be used by your hosting account at any given time. Most accounts will never use more than 128MB, but all of our plans allow ample room for multiple sites or larger applications. Virtual Memory: The amount of virtual and/or reserved memory available to your hosting account at any given time. This is in addition to the physical RAM where your applications actually run. Most applications will reserve memory that they never actually use. This "virtual" memory space is counted seperately from actual RAM usage along with any virtual memory mechanisms that your application may employ. Entry Procs: The number of processes with active connections through apache at any given time. This is not a cap on connections to the websites under any given account, but a limit on the number of scripts actively delivering content to apache at any given moment. To give an example, a limit of 50 might equate to 50 visitors streaming videos through your site or 500 visitors clicking around your blog. Total Procs: The maximum number of processes that can run under your hosting account at any given time. This includes entry procs. IO: The maximum disk IO speed for your hosting account. This is how much data you can read and/or write per second. This does not include MySQL data. 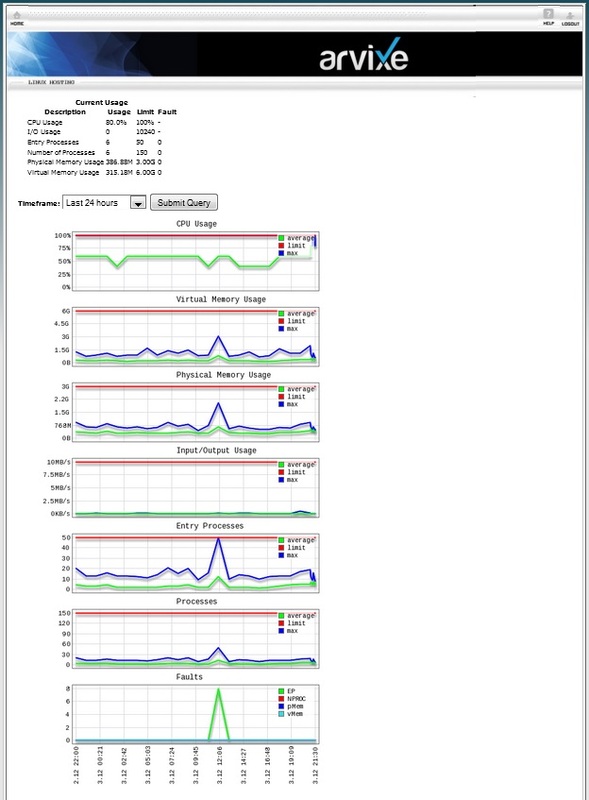 IOPS: The maximum number of disk reads and/or writes that your hosting account can perform in a given second. This does include MySQL data. These statistics should refresh on ever page load. When visiting a website that is currently being limited, you will receive various errors like 500, 508, 408, depending on things like which limit is being exceeded and how your script reacts to that limit being imposed. If the issue persists for unacceptable periods of time, it is a sign that it is either time to upgrade to a plan with more resources, or that you need to identify and control overzealous/abusive/malicious traffic. The access logs for the account will indicate which it is, and you can use the 'IP Deny Manager' under the security section of cpanel to help block the unwanted traffic. MySQL queries are currently limited only by IOPS, but upgrades are rolling out that will move MySQL processing into the userspace, thereby reducing one of the major remaining sources of poor performance on a shared server. Above limit is per domain or per email account? We don't do bulk mailing to unregistered users. But need to send 5000 emails in one go to registered users. Is is against your TOS? The limit mentioned is a per hosting account limit per control panel user. Arvixe prohibits the sending of bulk email, so a blast of 5000 emails would be considered bulk, and as such if you need to send to such a large list, I'd consider our marketing class or breaking it up into chunks over an extended period. It's still not clear to me how much 100% of CPU usage is. How much is that in numbers (GHz, Mbs, Gbs etc)? As the speed CPU's can vary from server to server for the sake of this post, you would need to contact us to see what CPU your server has in it, so we can give you the specific information you are requesting. Can you please tell us email box size/email id ? So if I wanted to run a dating website, and it got popular... Would I need to switch to VPS or dedicated server? Or would I need to start that from the beginning? I'm on a pretty big budget so I'm hoping I can start with just hosting! As your website grows, it will use more resources and as such you will need to upgrade your service. If you have a large budget from the start, I'd highly recommend a VPS / Dedicated server to ensure the best performance/reliability and security of your account. I just want to clarify something. I have a video sharing website whereby registered users can upload remote media or embed videos. Would this be supported by your hosting package and which package would be most suitable for this purpose? Depending on how many users you are expecting I'd suggest starting on the very least our business class hosting solutions to guarantee the best performance and reliability. Our VPS, Cloud and Dedicated offerings are also excellent solutions if your budget allows for those.